I found a ton of push pop containers I just had to buy, so of course I had to make some rainbow cookie push pops. I’m seeing push pops everywhere nowadays. You can buy the containers at amazon. My first idea was marshmallows. But they didn’t fit. Hence, I used the marshmallows to make these rainbow marshmallow kabobs. So I stuck with cookies. The containers are great, though I doubted my intelligence when I first attempted assembling them. (I should note I have two masters degrees. They didn’t help.) They come with lids and everything. *Find the circle cutter at the craft store or cake decorating shops. At the craft store, find the decorating bags, couplers, and tips. You’ll need one for each color icing you choose. Choose sprinkles or sanding sugar to match each color, also at the craft store. Or, just use white sprinkles. I use Americolor soft gel paste food coloring. Electric Pink, Orange, Egg Yellow, Electric Green, Sky Blue and Regal Purple used here. For tips on finding cookie decorating supplies, CLICK HERE. Prepare dough according to the recipe, chill, roll out and cut out circles. Bake according to the recipe and let cool. Prepare icing according to the recipe, divide, and tint desired colors. Prepare decorating bags with couplers and tips, fill with icing and close tightly with rubber bands. Work with one cookie at a time. Pipe a circle on the cookie, then pipe back and forth to fill the cookie completely. Immediately coat with a coordinating color of sprinkles and turn over to remove excess. Let dry uncovered overnight before stacking in the push pop containers. Since I ordered so very, very many, I decided to give one lucky winner a dozen push pop containers. But that hardly seems like enough of a prize, so I’m also throwing in a 1 1/2 inch circle cookie cutter. 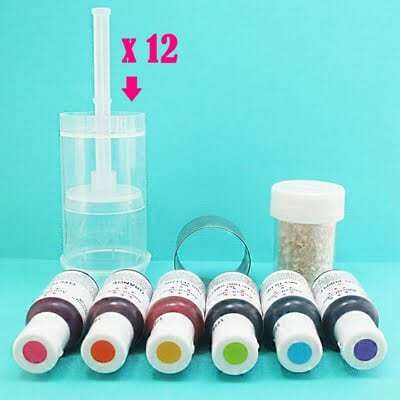 And since that hardly seems like a prize, I’m also including six bottles of Americolor Soft Gel Pastes (pink, orange, yellow, green, blue and purple). I’ll also throw in a little container of white sprinkles. Those looks like they would be a blast to make and a blast to give away to friends. Oh I just love push cakes! And what a cool giveaway 🙂 count me in! These are so cute! I would love to make them! The possibilities are endless…love the layered cookie idea. I'd like to try coffee cakes and other combos too. So many great ideas on the web with these little gems! I love your cookies in them. So colorful! OOh. Fun pictures. Love this idea. So cute. Super cute! What a great way to give away some cookies!! very fun and colorful idea! i love the push-pop packaging! Ooooh! I would love to win! I just decorated cupcakes for the first time (really decorated, not just slathering on frosting) on Easter and had so much fun 🙂 Cookies seem like the perfect next step! OMGosh those are so so fun! Silly me – I actually want to use these for ice cream! Wow doesn't this look like fun, my kids would luv this!! 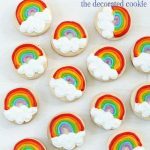 These would be GREAT for a rainbow party I am doing, such a wonderful idea! 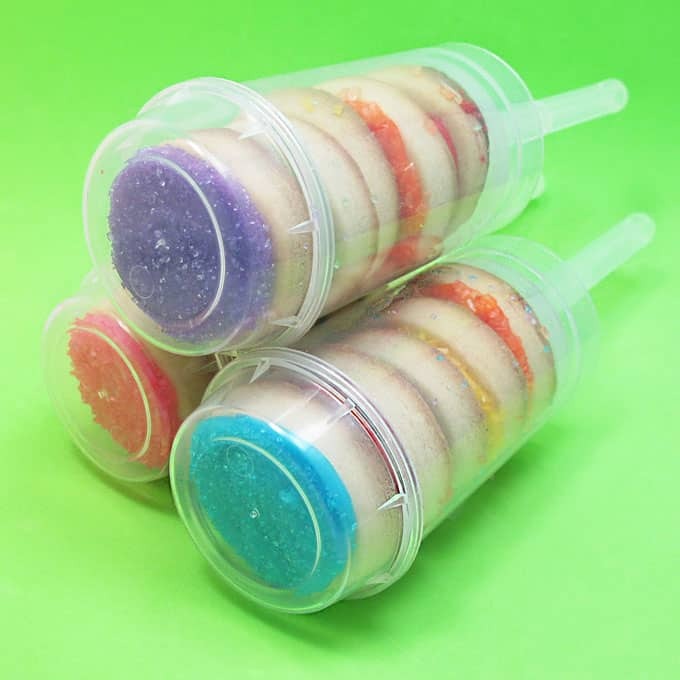 These cookie push pops look so cute! Would love to try to make these myself! I'm also very curious about the Americolor soft gel pastes. Adorbale idea! These could be used for so many creative ideas. I like both your blog and you on facebook already! I liked you on Facebook last week .. Glad I did too! Those are so fun and pretty! Wow!! These are just perfect! Love them!!! I love this idea! This would be a great little gift for my preschool students. So cute! I would love to give these a try! Thats so clever! I love it! Count me in! These are simply wonderful. I know many little ones that would get a great kick out of these. I know a lot of adults would love these as well. I would LOVE to win this! I am just starting out in decorating so this would be amazing!!! If there was a love button on FB, I would have hit that instead of "Like!" I "like" you on FB. Thanks so much for doing this giveaway! Wow you are soo creative!! I am already a fan of yours on fb! Such a clever way to use those push-pop containers. Love it! Sooo cute! I have a few kids birthday parties coming up too! These would be perfect. Cute…The rainbow push pops will fit in well with the graduation party I'm planning. They look so fun!!! Count me in too!!! I would love it and I "Like" you on Facebook!!! What a FANTASTIC idea… my kiddo's would love these!!! These are so creative and such a fun idea! I "like" you on FB too. I love your blog. This is such a cute idea for cookies. Love It! I hope these are the next big thing – how adorable!! I am already a Fan on Facebook! These are awesome! I would love to try these out! These are adorable, clever idea! As a kid, I loved pushups. As an adult, I love cookies. The idea is perfect! I already "like" you on facebook!! Pick me! Pick me! Lol, original huh? Those are cool! Thanks for the chance! I've never seen these but they are so cute! Would love to make some! I also liked you on facebook! I already like you on FB and as luck would have it I just happened to do it yesterday!! These are so cool!! I used to always get pushpops as a kid and reusing the containers is a brilliant idea! I can't wait to plan a summer party! Cute! I'd love to win! This comment counts as ROBIN'S (error when posting). These look so fun to make! I've been curious to experiment since seeing them! FUN!!!! I'd love to win these. I "like" the decorated cookie on FB! These are just so cute!! I just liked you on facebook the other day when you were featured on cupcakes take the cake. I am so happy I found you! I just printed out your recipes for sugar cookies and icing to make cookies for a wedding shower I am hosting. I can't wait. I would love to try my hand at making these push up cookies for my daughter's birthday, how fun! Thank you for this great blog! Yummy and well designed!!! I want those pushpops. Also I liked you on facebook! Way too cute! The kids in my neighborhood would just love it if I won these. partecipo non volentieri, ma volentierissimo al tuo contest!!!!!! i tuoi biscotti sono semplicemente deliziosi!!!!! a presto, un saluto dall'Italia! I'd love to win those! They are fab. Great giveaway! I love this. It is the best way to package cookies. I have been seeing these things everywhere! It never even crossed my mind to put cookies in there! You win at cookies! I would really love to win this giveaway because I have a birthday girl I know this idea would suit since she is the princess in our house. We would have a blast creating them together for her party. sooooo cute! would be perfect for my little guy's upcoming birthday. already liked you on fb! The cookies look great inside the push pops, great idea for an original gift, thanks! Ooooh, I'd like a chance to make these push pops at home! Thanks for the great giveaway. oh, and I like you on FB, too! I am so excited about these! I have two little boys who would LOVE to help make these push pops. Great giveaway idea! I never thought of putting cookies in the push up pops. What a great idea! What a cute idea, and a great giveaway. These look delicious! The giveaway is just the proverbial icing on the coookie! Thanks! Like it on my lekkerbekkenblog and facebook!!! This would be so fun at my son's upcoming birthday party! Thank you for a good link to buy the containers!! I was needing some for my daughter's first birthday party. I would love to win this package! I <3 Americolor gels! I tried making a red icing with Wilton and no luck. Then I found Americolor at Hobby Lobby. It worked beautifully. i completely agree that these will be the next big thing. i had no idea you could buy these! how great for a mini trifle, maybe tiramisu, layered cupcakes, even homemade sherbert pops? i would love to win some! Also, liked you on Facebook! They are SO cute!!! I am hoping to win and make them for my little boys 3rd. birthday!!! You are so dang creative and cute! I love these pops, I just started seeing cupcake pops too! that is so creative!!! I LOVE it! I have two little ones who'd think those were pretty fun to make! My nephews would definitely approve. So adorable! I love your blog! You have inspired me to try and make desserts for my kiddies pretty as can be. Your rainbow marshmallow kabobs were a big hit at an easter get together! Many thanks! suh- weet !! they are stinkin adorable!! Push pops rock my world. Best-giveaway-ever. WOW this would be so much fun to win. My kids would just love making and eating these. How cool are those?! LOVE. These would be so fun to make! me encantaria ganar. Es super original…… I love all. Glad you're on FB…I just "liked" ya! I have been thinking about buying the push pop containers for a while! They are adorable! WOW- super original idea- love it!! How gorgeous! Love your push pops!! I want to make some. also, my bad, did not realize you were on FB! I really like you now! Those look like so much fun! I would love to try it. I would also like to know where you ordered form, even it is ni quantities of 100, lol. That is so fun. How clever. Fun treats! Makes a good business strategy. I'm entering. Liked you on fb as Mxy Rxy Fernandez. My son and niece would love these cookie push pops! I love the colors. These look so cute!! Would love these! These are so cool! And I liked you on facebook earlier this week! Oh this is a BRILLIANT idea! I love it! And what a FANTASTIC, FANTASTIC giveaway!!! I found you on facebook as soon as I could! Pick me, pick me, pick me! So cool! Thanks for the chance to win a great prize! Fast and Fancy this is great. I love how cute, yummy, yet "contemporary they are! Of course I already follow YOU on FB thanks! You are sooo creative! Love it! And thks for the giveaway. I like u on FB! Awesome. My kids would love this. Such a cute idea! Would love to try them out. And liked you on Facebook too! Super cute! I wondered where to get the push containers, I will have to stalk them until they are back in stock! These are wonderful. I loved push up pop ice cream as a kid. Adorable Idea! thanks for sharing. i liked you on Facebook! My fingers are crossed to win. Just liked you on facebook 🙂 I really want to win! These look awesome. I would like to try some little brownies, chocolate and toffee….yummo. Thanks so much for inspiring us to be better bakers and try new things. omg i was just thinking about push pops the other day because i live in Australia now (am a New Yorker) and my kids have no idea about them. I keep a mental list of all the things from my childhood i want them to taste when we visit in the future! cool cookie idea! You are such a creative inspiration! I love your blog! Push POP containers are adorable. these are so cute! i'd love to try these out and noone will have seen anything like it over here in england!! ps and I already "like" you on FB, too! If you predict the trend I'll tell everyone I heard it here first. Who would've ever thunk it! 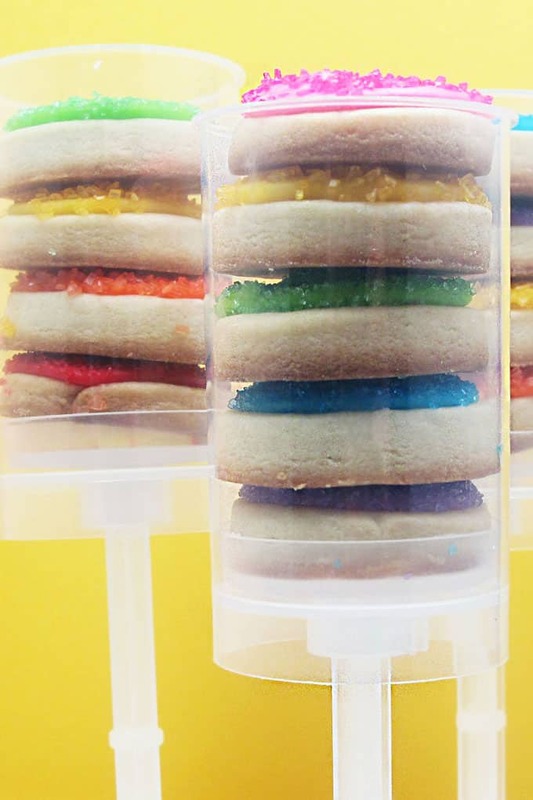 I LOVE this idea of Push Pop Cookies! Those are so stinking cute. Love them. Thanks for the chance to win! I just liked you on FaceBook! Oh, what a Sweet Giveaway and would love to win and make these for my grandkids. Seriously, what will you think of next? Love it! These are so pretty and I love the spring colors you used. What a really fun idea! I also like you on FB. Pretty, creative and simple. This would be great for valentine's day. AWESOME! Just found your blog/site and signed up immediately. I can't wait to try these for my grand-daughters (and for me too LOL). I never even new you could get these push-up containers. Thank you for a great idea and I look forward to your next ones! what a great idea! Although my kids are grown they would still love these! My oven just decided to die on us… if I win this, I'll be motivated to buy a new one and bake the cute cookie push pops! Let me win, let me win! These would be great at my granddaughter's birthday party! Thanks for the ideas. There are so many possibilities for using these containers. What a fun way for a birthday party. Thanks for the chance to win! Simply adorable! I like that in my mind it's just one big cookie…even though there are 5! I can't wait to make them, so thank you for the idea and recipe!!! They would be the best party favors to give your guests! facebook is sadly lacking a "really really like" button, but I do like you there. very nice idea! I fancy making some of them for my birthday party 🙂 no idea where to get the push pop containers from though! Spectacular idea…I would love to win this set of goodies! I liked you on FB..happy I did! already addicted to push pop cupcake concept! I like your site on Facebook! Wow, what a cute idea and giveaway. 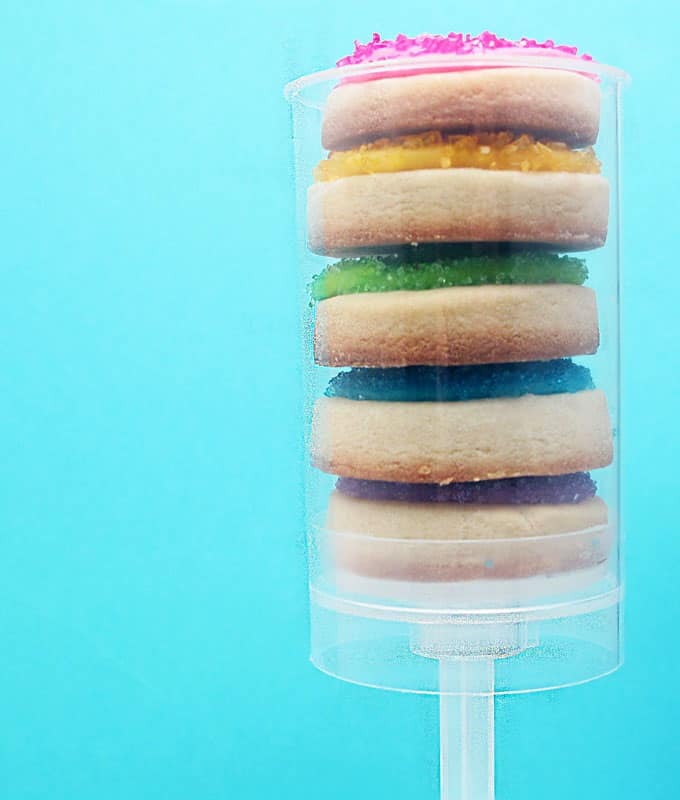 The push pops cookie idea is so very cute! These are just adorable and my grandchildren will LOVE them! Thanks for the opportunity with the give-away! Oh good lord, I was JUST this morning chatting with someone trying to come up with something cute and innovative and sweet for a favor for a woman's group meeting. VOILA! Answer? These……. Thank you SO much for your, in this case, DIVINE inspiration! Oh, IMHO FB needs to add a "Love" button, just for pages like yours. I "Liked" you on FB but really, it's just not a big enough word…..
Found you on Facebook and "LIKE" you there, too! These are soooo cute. Love them. This is such a cool idea!!! We called them pushups when I was a kid, and I still love them, whatever they're called, and whatever they contain!! Yours are adorable, and are a must for my granddaughter's next birthday party!! Thanks for sharing! I also really really liked you on facebook… and thanks for the giveaway!! This is such a cute idea! Both kids and adults will love it! These are fantastic and so cute, thanks for the chance to win. Liked you on FB thanks for the 2nd chance to win. 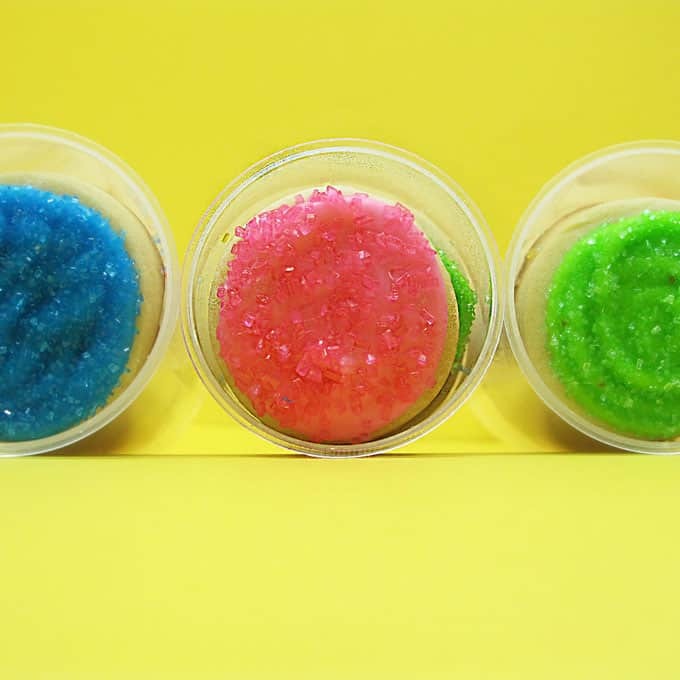 Cookie push pops–what a great idea! Love it! OMG those are the cutest thing. I just shared your page with my cousins wife who is just starting her own cupcake business, what a great idea. I would of course love to be in the giveaway! I just want your cookbook, but this is way more than anyone could ask for. These would be so cool to make! Thanks for the opportunity to get the push pop containers and other fun stuff to follow your lead! WOW what a great idea!! thanks!! Never heard of push cakes /cookies – but they look cute. I love your wacky marshmallow ideas and have just bought a load of candy melts to have various cooking fun with my toddler. These are so cute, I've been seeing them on all kinds of sites! What a great idea for a giveaway! Such a fun and creative idea! those are the cutest pushpops i've seen! i want to make these! it would be so awesome to win! I totally and completely need these!! What a cute idea. I know some kids who would love to get these. Push pops making a big come back! Who knew? That is the coolest looking treat. My kids would have an absolute blast trying them out. What a great idea! These look like so much fun! Oh I so totally hope I get this! I just started my cookie blog would love to turn it into a full fledged business! YOu are inspiring! This is so clever and look easy to make — thanks for sharing with us. looks like a lot of fun to make these pushpops. Oh these push pops are amazing!! & LOVE the little rainbow of cookies in them!! What a fun way to serve up cookies! How adorable! I love the mini rainbow cookies in those. Thanks for the chance to win!! Wow. very cool. Can I try? What an amazing prize!! I have been wanting to buy some push pop containers. I also love all the bonus prizes you are throwing in….AMAZING!! I already like you on Facebook! Thanks for the amazing giveaway! My grandchildren would so love it were I to win this giveaway. Really a cute idea. How thrilled my girls would be to find treats inside of these! I am just dying to try the pushup pops… I just need a good excuse..
How creative. Love the idea and wouls love to make these. Thanks for a chance to win. Love it! Super cute idea! I love this idea, they are so cute! I really want to try it now! Thanks for sharing, great giveaway! these are amazing ! i would love to make 'em ! So, I'm up in the middle of the night b/c our house (my kitchen!) has been flooding in a storm. We've finally got it settled (hopefully), but since I'm wide awake, I checked out your blog just in case you're up, too! 🙂 Please, pick me! These are WAY TOO CUTE!!! What a way to start out the summer! Fun sweet treat and giveaway. Thanks for chance to win. These are adorable and look like a lot of fun to make! I like you on Facebook under Berksgirl Lisa. these are awesome. love the idea! I love these! Tried to order them a few weeks ago with no success. Would love to play with them! Love this idea! Thanks so much for sharing. It's great we can count on you for crafting inspiration! I have never seen anything like this before, it looks neat! I would love to come up with an idea to use them, and the food colours to, the pastes are so hard to find around here without paying out the ears! The grandkids would have such fun with these. They scream summer fun! Thank you for sharing, especially with an incredible giveaway! I love the idea of push pop cookies. I am just starting to really get into cookie decorating and am having a blast! Wow, that's really a cool idea, and a cool giveaway! How cool are these??? Love the idea! Of course I had to LIKE you on Facebook. You are brilliant! So cute! My grandkids would LOVE cookie push pops. I recently made basbeball cookies using your recipes and I love the way they turned out! I LOVE LOVE LOVE this idea! How original! I "liked" and commented on your FB page…I'm a fan!!! Looking forward to your updates! Holy cow! What a great new idea! May need to jump on the band wagon with this one! I didn't realize you had a Facebook page. Here's a big, fat "LIKE" for that!!! Love the giveaway. I have so many ideas! Even putting ice cream sandwiches in there! I "liked" you on Facebook. And we love featuring you on Dollar Store Crafts! These are amazing!! and I have been looking for coloring gel everywhere!! Ok my 3 y/o & I are already fighting over these delicious looking yet sooo cute cookies!! !Push-pop cookies are a great idea!! Ooooooh, I LOVE this idea! Sign me up to enter the giveaway! "Liked" your fb page, love it! how fun! what a great idea. Love this idea!! I have following the new push pop cake craze and would love to try this out! I never even thought of cookies in there. These look like so much fun! I could make them with my siblings! Already liked you on Facebook!!! I 'like'd you on facebook! They would be great favors for a child's birthday party too! Great idea! Wow I want the push cakes!!! thanks for the giveaway and all your tutorials. I am already a FB follower….your cookies are beautiful, i love seeing the new creations you come up with. Thank you for this giveaways ! I play because I dream to make push cake pops, or things like that…I cross fingers !! I play twice because of course I like you on facebook too ! 48 hours to reponse it is a little short ! I hope I don't forget to come the D-Day to see the results ! Thanks so much! This is great! What an awesome giveaway! I would love to be included. Thank you! Adorable packaging (: I'd love to make them. Liked you on facebook as well! Yummy AND adorable! Can we say sugar high! I'd love to win the giveaway! I LOVE IT!!! What a fabulous giveaway, too! Simply lovely. We admire your work and your blog. Please, visit our blog. We've a present for you. I'm a new facebook follower…thanks for the opportunity! LOVE THIS IDEA!! As a cookie newbie I have learned SO MUCH FROM YOU!!! Lovin' your tips and ideas! Can't wait to try this for a summer treat! These are too cute! Would love to make them, thanks for the opportunity to win this! what are great idea. Thanks for sharing this! I just discovered your blog and love this adorable idea! What a sweet giveaway! Your cookies are always adorable! I like you on FB, too! They look yummy, I would love to have the containers and goodies. Thanks for the giveaway! I love these push pop cookies and cakes! I can't wait to get me some and try them. Thanks for the idea. Please count me in for the giveaway! I liked u in FB!!! Looks like a lot of fun to make! Yum!! I love this idea! THey are beautiful, I hope I win!! Super cute! Little chocolate ones could be delcious too! liked you on Facebook too! Oh how I would love to win these! My students would love these for a year end party!!!! Thanks for the opportunity! I liked you on FB…Thanks again! Just thinking to myself, "I wonder if I could order a smaller qty. than 100." Love these cookies – they are so pretty & happy!! I would LOVE to win this. I've been trying for ages to get hold of some of the americolour gels (or any gel), and people either look at me like I've invented a product or tell me they can't ship to the UK when I find them online. It makes me sadface. These are so cute! I would love to make them!!!! I have been following your website, love your creavitity! very cute. What a fun way to enjoy your treats! yeeeei!!!!! Finally a giveaway I can participate of!!!!! you can make push pops out of anything with that, it's unbelievable!, they're awesome!, i hope i get lucky =), cause i sure can't find those here in Peru.. I love this idea! I have also seen push pop cupcakes. Oh yea, Americolor rock too! I would love to score some more and make these for a kids party, they would be a hit! Thanks for the giveaway! What a treat at a summer 2nd birthday party. I'm from Spain, and I love this push cakes and your blog too! I have been searching for a cute treat for my daughters wedding shower. these are perfect. She LOVES my butter cookies. Oh thank you for the idea. I like and comment you in FB! These push pop cookies are so CUTE! Love them! I have been trying to track down somewhere that has the push-pops for a reasonable price for over a month and you're right, they are sold out until June! You are too sweet to even give just the push-pops away, but to throw in extras – you are the best! I would love to make these! I am all about cupcakes, but really wanting to get into cookies! I just saw these on the news this morning!!! Then you had more kinds on your blog, I love them! Me encanta tu blog y me encantan tus galletas!! aun me queda mucho por aprender, espero hacerlas algun dia igual de bien que tu! So sweet of u 2 think of others. I can't believe you ordered 100. I would love to own some of those-they look sooo fun! holy cute batman! I love your ideas. Thanks so much for sharing. and… I REALLY really really like you on facebook. I love, love, love this idea they are so cute! Would love to win this! I follow you on fb as well! I'm thinking these would be awesome for end of the year teacher gifts! PICK ME, PLEASE! Thanks. These are SOOOOO cute!! My sister is a 1st grade teacher and I would love to make them for her class for the end of the school year. Thanks for all the AMAZING IDEAS!!!! Oh me me me me!!!! My 9 year old daughter looooooves cookie and cookie push pops would make her soooooooo happy!!!! also "liked" you on fb, of course! Love these! Hope I win. What a gorgeous cookie presentation! The push pop containers could lead to so many creative desserts. Yum! oh how i would LOVE this prize! its seriously so fun! I love this. I will have to give them a try. I like you I Really like you! You have the coolest ideas! I may even pop them in the freezer! Liked you on Facebook too! yay! I would love to win this omg!!! I also like you on FB already! Love your work!! I mean, I really, really like you! I just popped over from One Pretty Thing and I love your work. The "sandwich" sandwich cookies?? How much fun is that? And cookies with candy floss?? Brilliant! My fav is the gingerbread house on a stick! 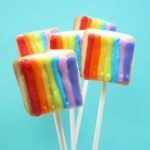 The rainbow cookie pops are going to make me the Favorite Aunt For All Time at the next big family dinner! OOh, great giveaway! And so clever! oh these are super cute. what a great idea! Really love all your cookie creations!! So fun to follow you on facebook! What a great idea for a fun and unique treat! These containers are so cute (heart the lids!). I'd love to try my hand at creating these innovative desserts! These pushups look like they would be so much fun to play with! These look like so much fun! I love them! Those are so cute! I just started using americolor and love it! I would love to increase my collection! I'm thinking mini cupcakes with frosting…cupcake in a pushpop…I think it can be done! Wow! Such a good idea! I've never seen these before seeing them on your blog!! I'm kinda pumped to see if I can find these somewhere! I love to give stuff away to my neighbors and friends….good job on the site!! Wow! What a super cool giveaway! I would love to win:-) Cookies and /or cupcakes inside a push-pop container…BRILLIANT! Thanks for the awesome giveaway! Oh! Such a great idea. I'm saving this one for sure! Those are the cutest things ever! I'd love to win them! I love the idea of the cookie push pops! love this idea I starred it in my google reader to use as party favors for my oldest girls bday party in august! They're lovely, hope I get lucky ! What a generous give away…but more importantly…what an adorably amazing blog! LOVE the cookie push pops idea!! I've been eyeing these off for so long! 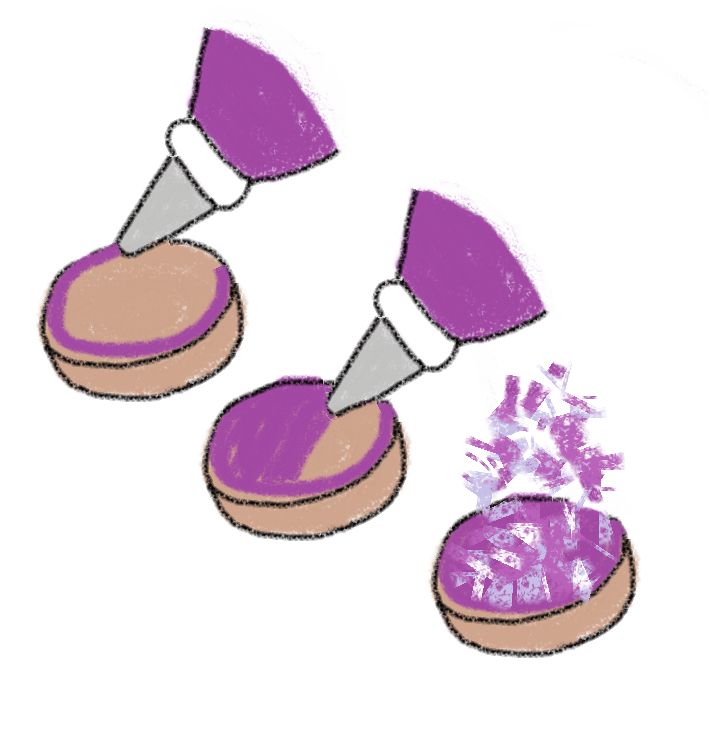 yet another awesome idea for them! Very cute – and they look tasty too. Thanks for the giveaway – I love push pops. this looks so cute and fun! thanks! Super original Idea… Ive seen ice cream and Ive seen cake in them but not cookies. Thanks for the great giveaway! These would be great for my kids birthdays this month. OH MY! Sooo cute! 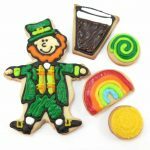 I am new to blogs-not a young lady, but I am a cookie girl-and am so impressed with all the creativity and sharing. How nice you are and how talented! These push pop cookies are just too cute and darling, and I would love to be a winner!!! Love these!!!! And I already like ya on facebook! Those are so cute, what a cool idea. You could put anything in them. So cute…I can't wait to try them. Your site makes my brain do cartwheels! Beautiful cookie push pops!! These push pops are so neat! Love the idea – I will be using these sometime when they are available to order again. Thanks for all the great ideas! I LOVE these! I saw them with mini cupcakes, but I LOVE the idea of cookies even more! Thanks for the opportunity to win. I just found your blog and would LOVE to win this. Thank you!! Adorable. I would so love to make these for my niece's birthday! Those are the cutest things ever!!! I would love to play with them :). Thanks for sharing! I would love to try these. You make awesome stuff. So cute and awesome idea! I love all the bright colors! I'm so happy that you are having a giveaway for these! Looking forward to being the winner of the push pop contest!! looking forward to being the winner of the push pop giveaway…I'm ready to make them today! Those are amazing! I didn't know they made those to buy! They bring memories of eating the push up ice cream as a child.. I have so many ideas running through my head.. Possibilities are endless.. Thanks for the giveaway! I also like you on Facebook! :-)..
Found this just in time. "Pinning" the recipe and will cross my fingers about the contest. This is so darling. I would love to make them!! I love that idea and will think of something really cute to put in those containers. That is one awesome giveaway, sure hope I win. My daughter can't wait to give one to all or her teachers. Thanks for sharing! Would love to win this as since you showed them,(push Pops)I have wanted to try them. Thanks for the give away. I love it!! I remember eating push pops on the play ground..i want! Love these! And would love to give them a try with my preschool students. Thanks for the chance to win! This is my comment for my entry. These are adorable. Can’t wait to use them as party favors for a b-day party! Love, Love, Love these push pop. There are so many great ideas out there for them. I love your marshmallow idea! Great idea!!!! These look like fun! So many possibilities! I’ve just started making these and love them.